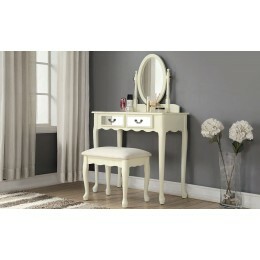 The Lumberton Dressing table is one of our best selling vanity table for years. The elegant design is to be admired and the quality construction is an investment for years to come. The top 2 drawers with crystal handles is perfect to house your cosmetics and jewellery and the large centre drawer to provide maximum storage space. The dresser comes with an adjustable mirror and a soft padded stool. Above all, this comes at an affordable and unbeatable price.